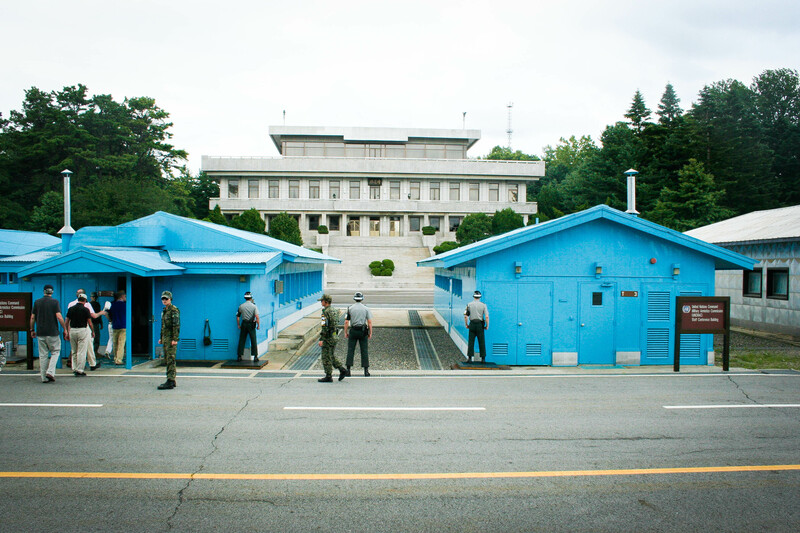 Recently, I won a discounted fee for one of the most popular tourist destinations in Korea: the Joint-Security Area (JSA) between North and South Korea on the DMZ. 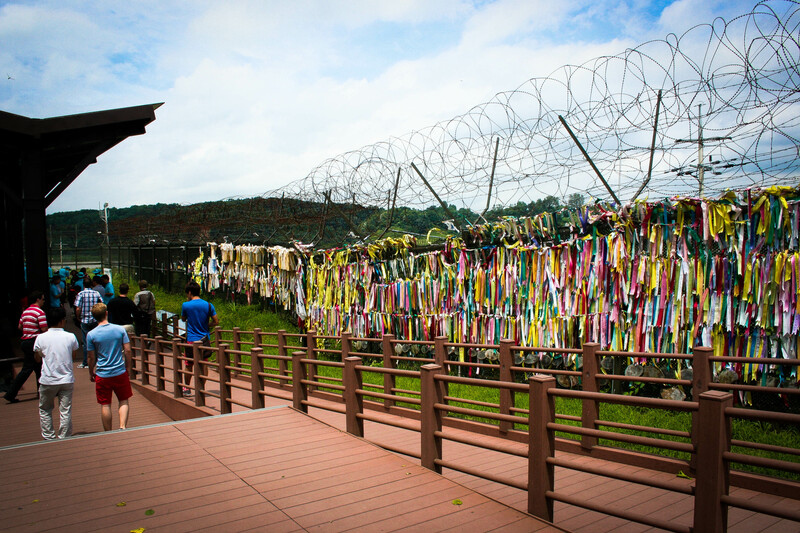 Despite being commonly referred to as “the most dangerous place on earth”, trips to the DMZ are strikingly popular among tourists visiting South Korea. 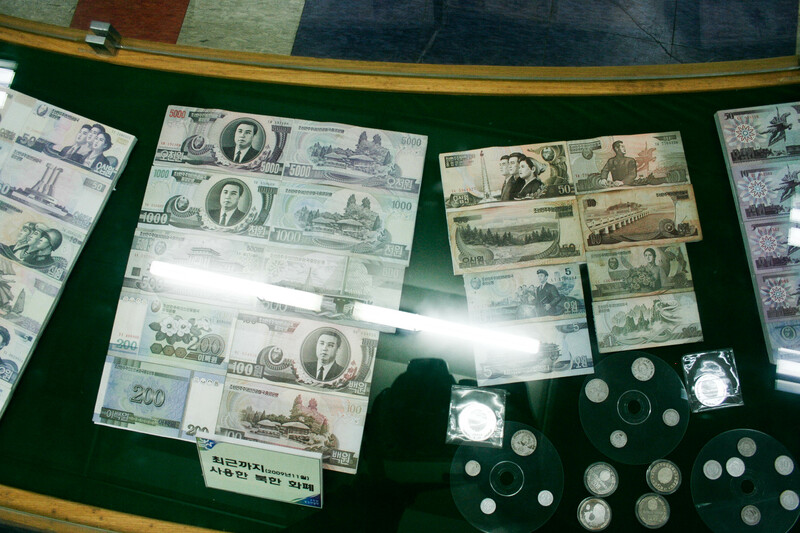 Prior to this trip, I’d already been on two tours to different sites along the 38th parallel, separating the communist North from the capitalist South. I’d never visited the JSA before, which is arguably the most interesting stop along the border. With American and ROK (Republic of Korea) soldiers on the Southern side staring down DPRK (Democratic People’s Republic of Korea) soldiers on the Northern side, the line on the ground separating these two countries seems more apparent than ever. In other words, tensions are VERY high. That said, the rules for visiting JSA are understandably strict. 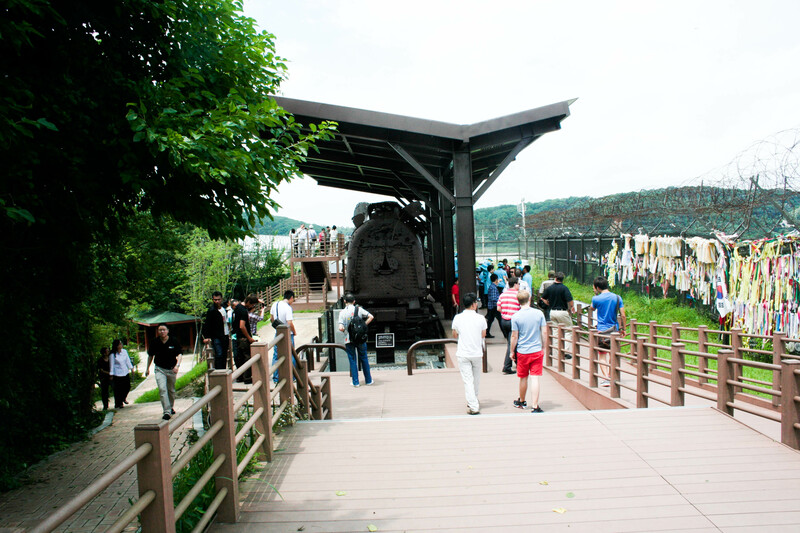 For example, even though there are dozens of independent operators offering tours to other DMZ sites (such as tunnels, military museums, and observatories), only a few select government-approved tour agencies are allowed to take visitors to the JSA. It’s not cheap, either – most JSA tours start at around $77, while other non-JSA DMZ tours can go as low as $33 (like the one I took). That’s partly the reason I hadn’t signed up for a JSA tour since coming to Seoul (student budget!). 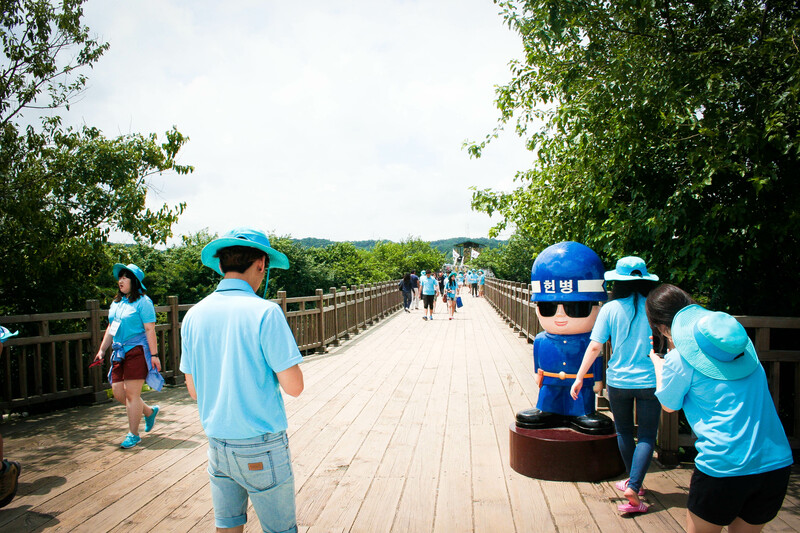 I did do a free DMZ tour as part of the summer Korean culture program I’d attended back in 2011. As well, I opted to go for another tour in the winter of 2012 that visited some other sites I hadn’t seen, mainly because it was offered at an affordable price ($33) through When in Korea (WiNK). 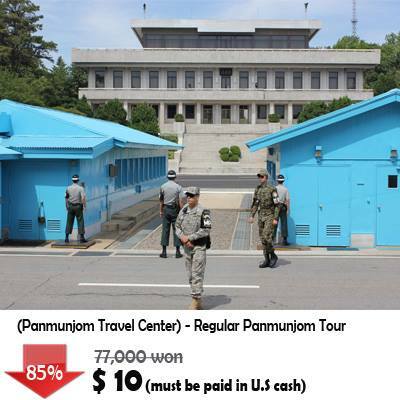 In the case of this JSA tour, offered by the Panmunjom Travel Center, I’d won a facebook draw a few days prior for a discounted fee. Normally, the cost of the tour is $77, but I only had to pay $10. The tour company occasionally uses this promo to fill up empty seats on the bus a few days before the departure. Anyways, after receiving a facebook message confirming my spot, I sent my passport to the company. Part of visiting the JSA requires having a UN-performed background check (serious, right?). I passed, so come Friday morning I was set to go! Shortly after arriving at the Lotte Hotel in downtown Seoul, we were on our way to the first stop along the tour, Odusan Observatory. Once hearing that we were visiting an observatory, I got a bit disappointed. Since I’d already visited a few others on the two other tours I went on, I thought it would be a bit boring to see the same place for a second or third time. However, I’d never been to the Odusan Observatory. 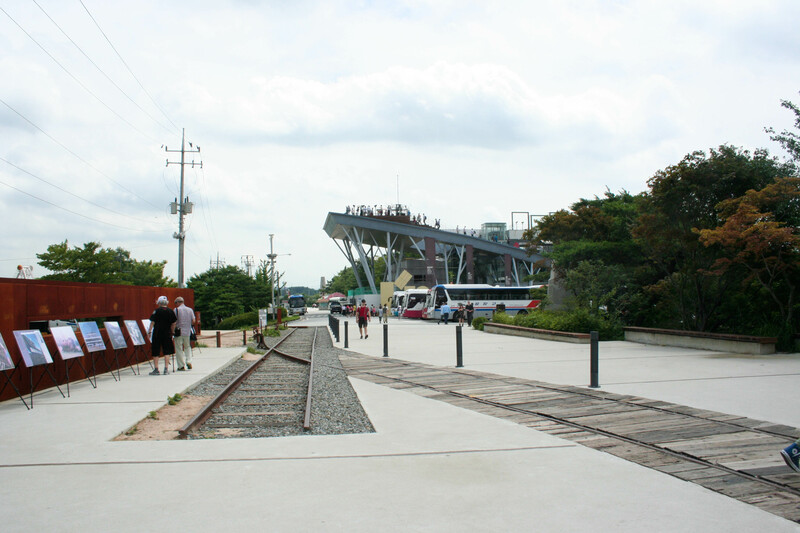 In fact, I’d have to say that it’s one of the better ones I’d visited along the DMZ. 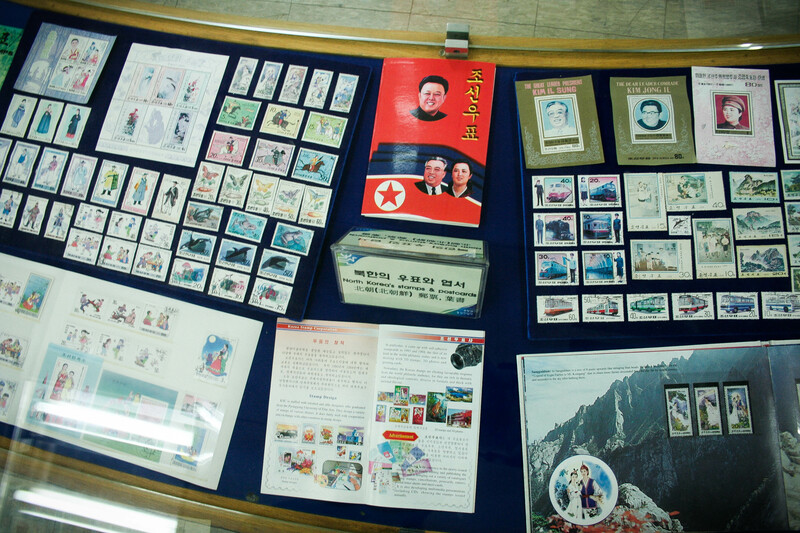 Unlike other observatories, there wasn’t any visible North Korean “stuff” in the landscape (ex: propaganda posters, military watchtowers or outposts, etc). However, the mini museum inside the observatory was very interesting. 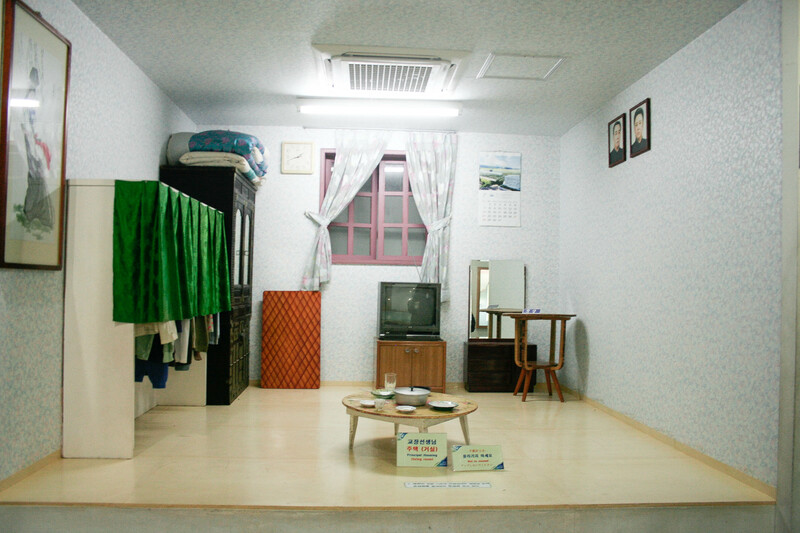 The focus was on life in North Korea, so they had a replica of a typical North Korean class and living room. 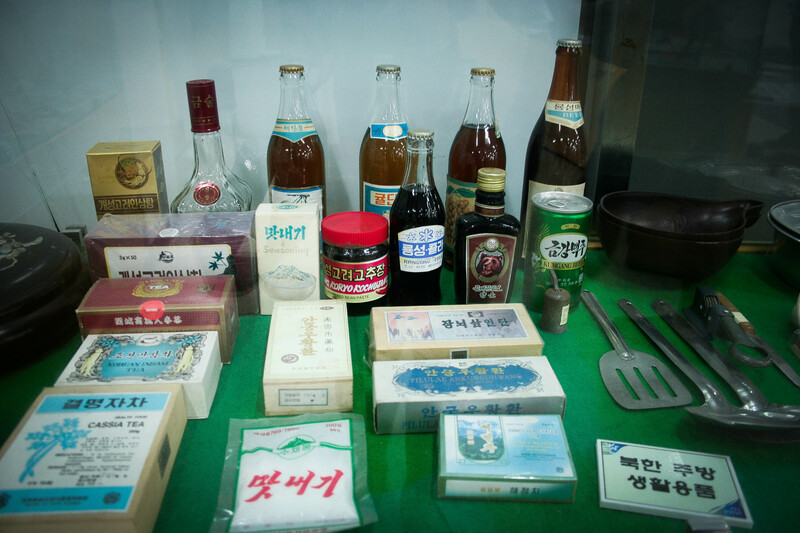 Our tour even included a Q&A with a North Korean refugee, who was a woman in her 40s or 50s. 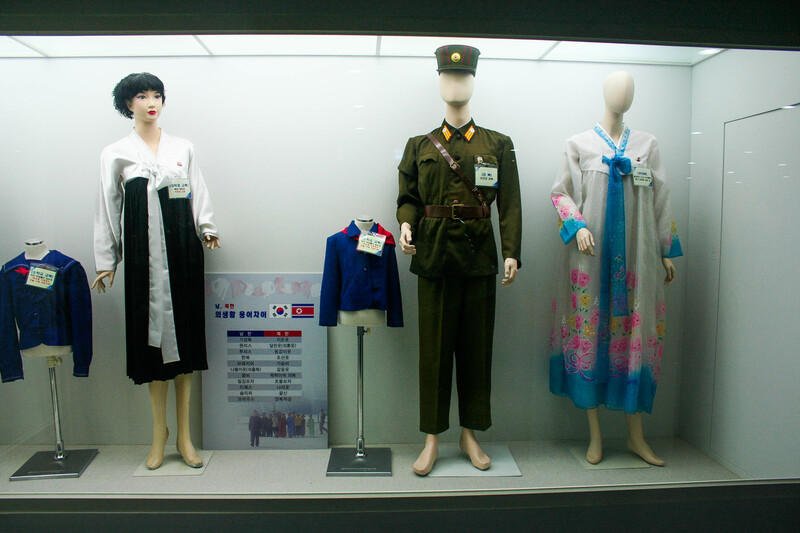 We sat in the replica classroom and asked her questions about her life back in the DPRK. I asked her what made her decide to leave, and she said (with the help of our tour guide translating) that it was the fact that her sister had already left. It was a great follow up to the film that we were showed upon arrival, which briefly showed the history of division between the two Koreas and the state of human rights abuses in the Hermit Kingdom. 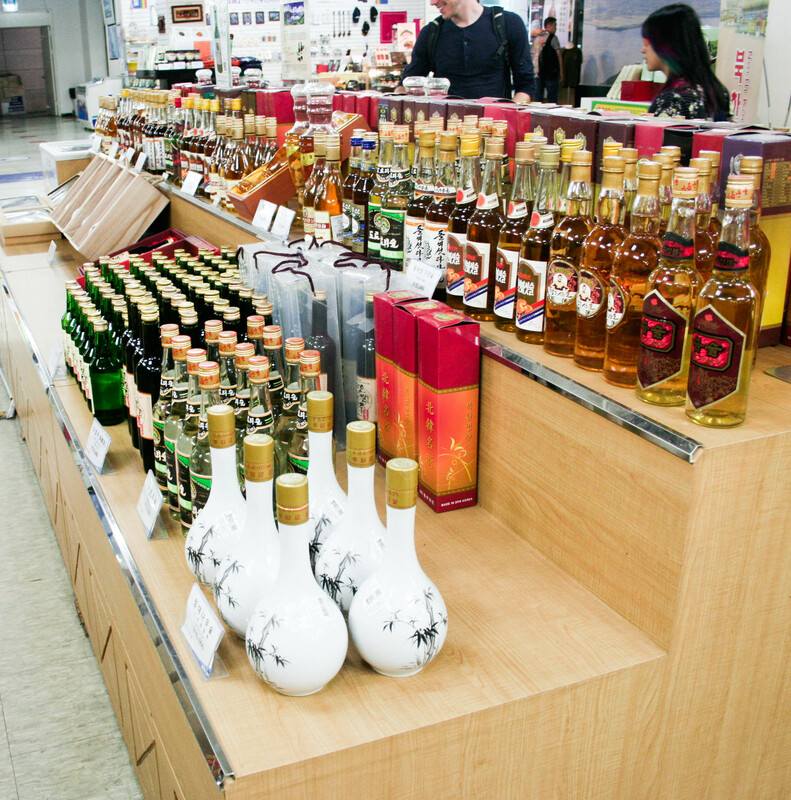 The observatory’s gift shop was pretty impressive as well, with a lot more DMZ and North Korean products available for purchase than at other tourist sites. After wrapping up our visit at Odusan, we moved onto our next stop. 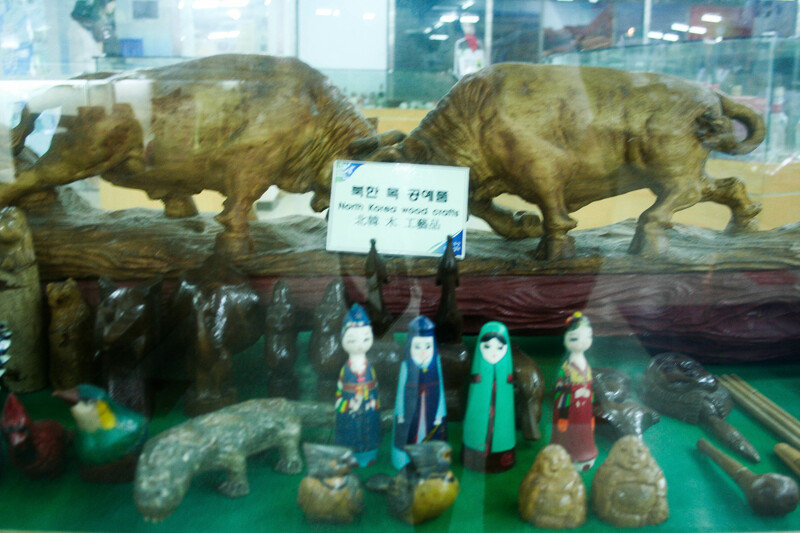 Now, I’m not going to say much about Imjingak, mainly since I already visited the place on my prior DMZ tour with WiNK. Granted, at that time it was covered in snow and almost devoid of any other visitors; while on this visit there was no snow to be seen and instead just droves of tourists. I took a look at the pond, which I must’ve missed on my first visit there. 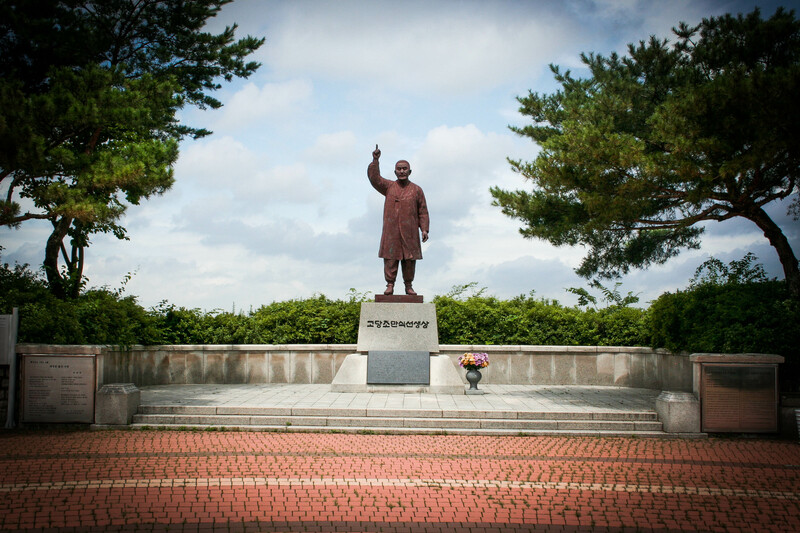 Something I didn’t notice on my last tour – this monument is a symbolic ancestral tombstone for all North Korean refugees who cannot visit the remains of their deceased relatives back home – moving. After snapping some photos, I headed back to the bus, but not without running into Patricja, a Polish friend of mine from the Friends of Invest Korea program I’m in. 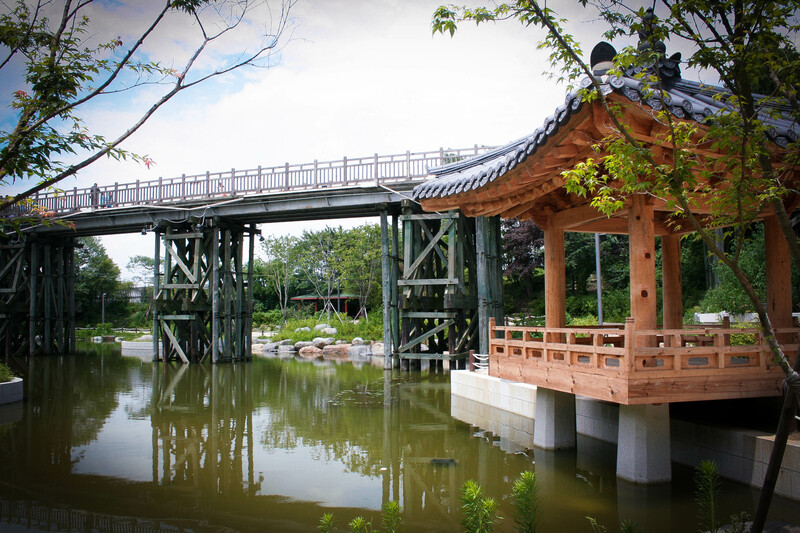 She was there on a group trip with the Korean Ministry of Environment. Again, I’m not going to say much on this subject. Since those who know me know I’m a shameless foodie, the fact that I don’t have much to say on the subject of a meal will understand that this is not a good thing. Okay, so I can’t complain – I only paid $10 for the trip. However, everyone else was paying $77 – and for that price, I’ve gotta say, the meal was pretty horrible. I’ve eaten a lot of Korean BBQ since abandoning my meat-free days here, and this was pretty bad. The lettuce was limp, and there was enough grease in the table-top bulgogi pan to drown an army. It was clear that the restaurant survives on business from DMZ tour busses, as it’s in a pretty isolated area, and all of the other diners were being herded to their tables after getting off of their own respective tour busses. 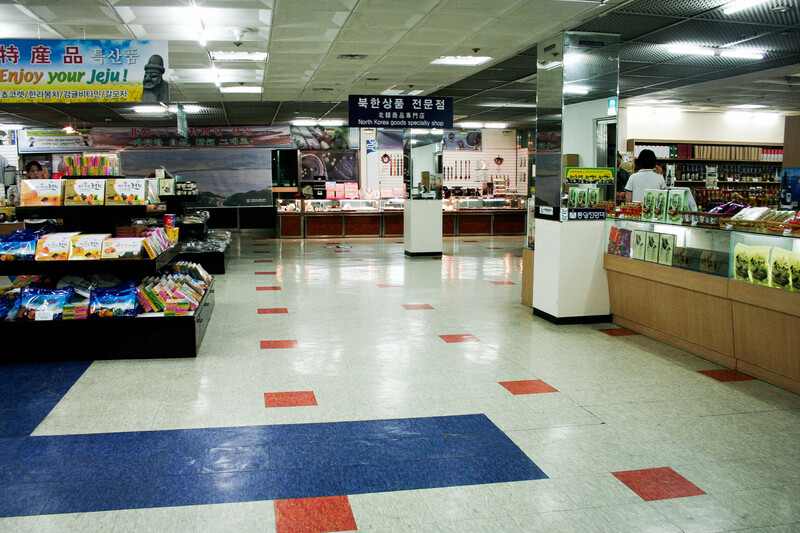 Compared to the restaurant we ate at on the DMZ tour I took with WiNK, this place was not very impressive. After lunch, we got back on the bus and were off to get our passports checked on the Unification Bridge. Everything was good to go, so we continued onto Camp Bonifas, which was the military base that we would transfer busses at. 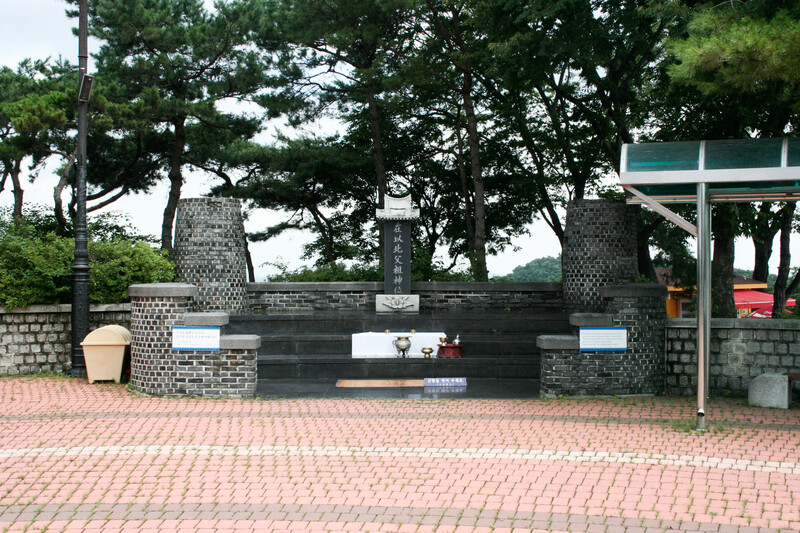 Camp Bonifas is operated by both Korean and American troops. At this point, we were now officially in the South’s side of the DMZ. We just needed to get onto a UN-approved vehicle for our trip to the JSA. After meeting our supervisor from the US military, we were on our way to the JSA. Finally, we’d arrived at the main attraction of the tour – the JSA. As mentioned earlier, everything was super strict. Back at Camp Bonifas, one of the tourists had to change out of his shorts and into a pair of pants. It appeared that I was one of the few tourists that actually took the JSA dress code seriously, but in general they were pretty flexible with it. The dress code prohibits visitors from wearing: t-shirts, miniskirts, shorts, heels, exercise clothes, slippers, faded jeans, tights, leggings, and trousers. Previously, I thought the reason for this was partly due to safety concerns (ex: a woman wearing heels isn’t exactly in the best position to make a break for it, just in case shots get fired). According to our tour guide, the dress code exists in case the North decides to feature any of the tourists in state propaganda. Those who dress “sloppy” make perfect fodder for the North’s favoured depiction of American (or other Western) foreigners. Additionally, we were instructed not to make any gestures (ex: pointing, waving, etc) towards the North Korean guards. 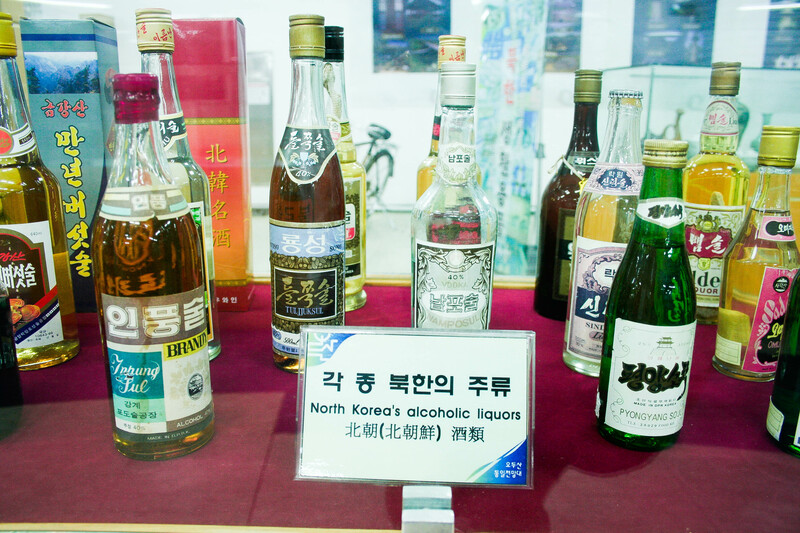 This was for the same reason – those who are shown waiving risk being depicted as “someone wanting to defect to the North” by the DRPK’s propaganda artists. After being given these briefings, we made our way – single file – to the JSA. 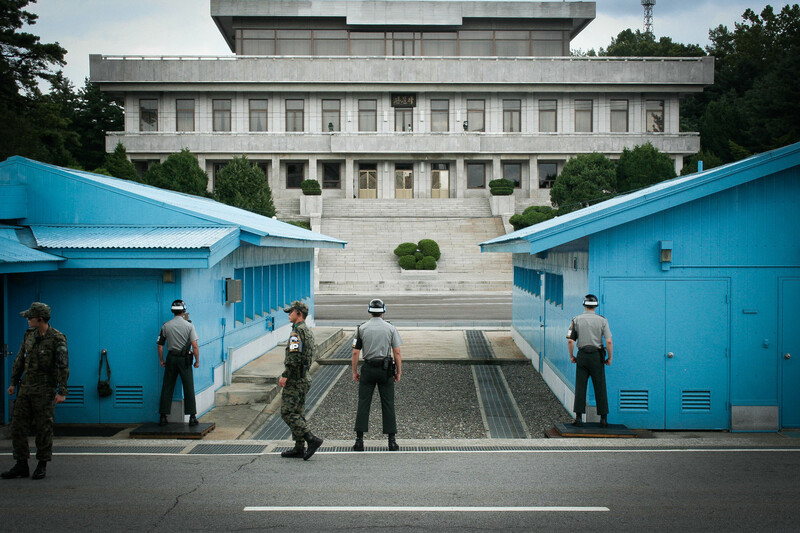 We were quickly shuffled into the Freedom House Military Armistice Commission Building, where one can put one foot “into North Korea”, and one foot into South Korea. South Korean guards were in the building to keep watch, and much like the British bobbies in London, they’re supposed to keep still in the ready position – a perfect photo opp for tacky tourists like me! This building is used for signing official documents and to have UN-monitored meetings. 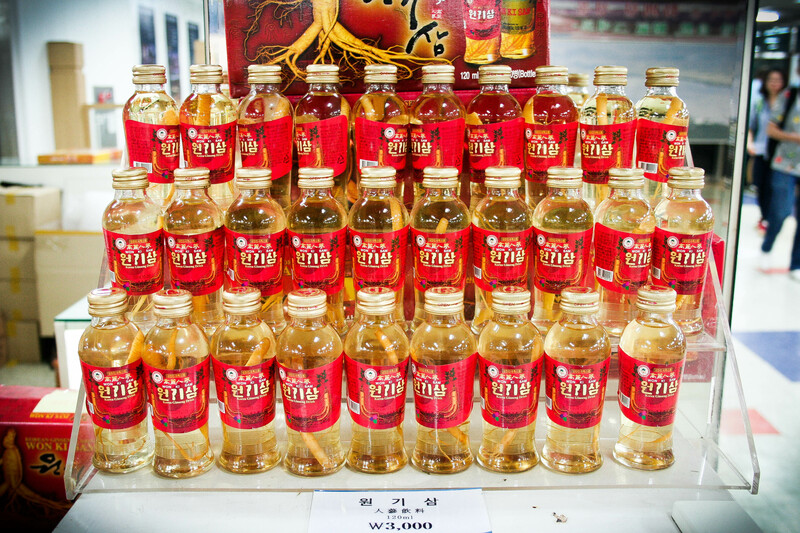 Since it’s half in North Korea, half in South Korea, it makes for a fairly neutral meeting space. After taking a few photos in the Armistice Commission Building, we moved outside. I was a bit disappointed that there weren’t as many North Korean guards as I had expected (based on different YouTube videos I’ve watched), but it was still cool to see. Before you can say “bomb threat”, we were shuffled out and back into our tour bus. From there, were were back on our way to Seoul. All in all, it was a good trip. I liked that they brought a North Korean refugee along with us to answer questions; it was probably a great experience for those who only had a week or two to spend in Korea. Additionally, I liked that we were back in Seoul by 4:30pm. Everything ran very smoothly. 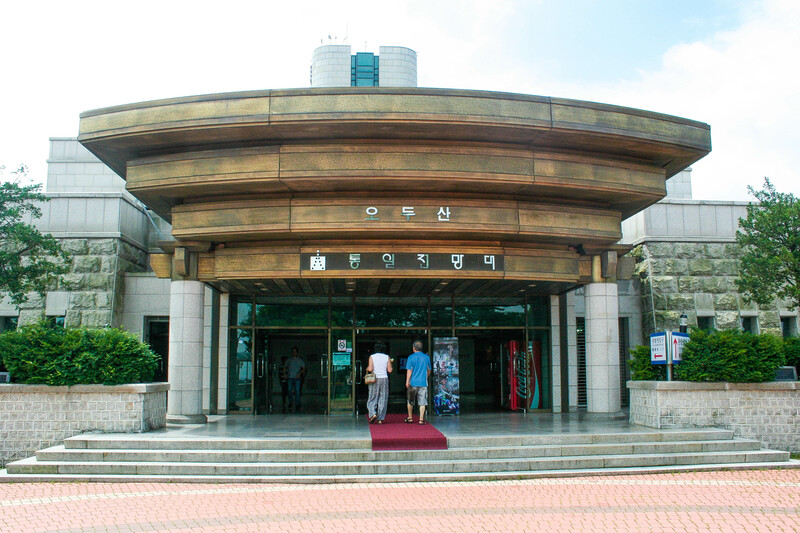 Would I recommend Panmunjom Travel Center? If you must see the JSA, then yes. The fact that they brought along a North Korean refugee was quite memorable. The tour guide was alright – not fantastic, but not horrible. 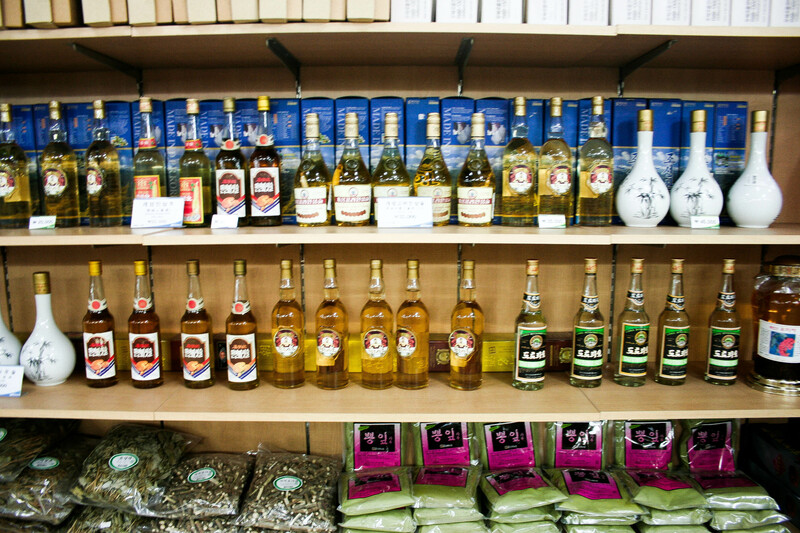 If you just want to be able to gaze out into North Korea and buy some North Korean souvenirs, then I’d recommend taking a tour with When in Korea (WiNK). 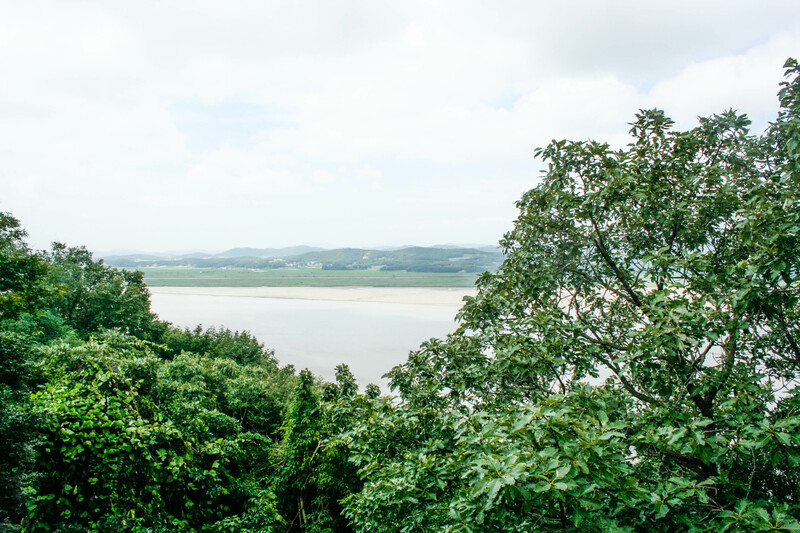 Though not regularly offered, WiNK’s DMZ trips are affordable and cram a LOT into a one-day tour; around double the sites that the standard DMZ tour operators normally offer. How can I get an 85%-off travel deal to visit the JSA? 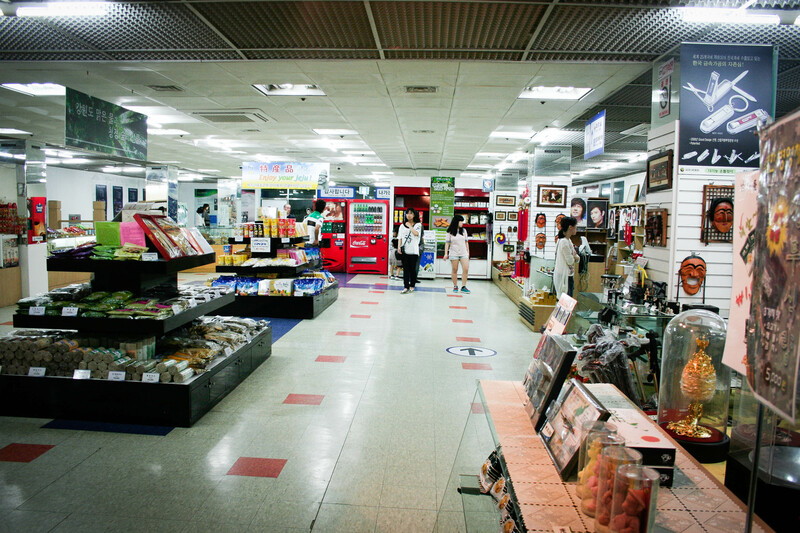 Simply like the Panmunjom Travel Center on facebook, and keep your eyes peeled for their next deal. Students can get a discounted rate of $65 to go on this tour.